Spend significant time outdoors, as certain courses require more than 50% of class time in the field conducting hands-on research. Travel to Costa Rica, Cape Cod, or many local natural areas where you'll monitor water quality, protect wetlands, study plants and animals, and work with local schools. Graduates go on to use their skills and knowledge to protect delicate habitats, solve complex environmental issues, and develop smart policies that guide society in the use and preservation of natural habitats. Continue into an accelerated graduate school program, either at Franklin Pierce or through a partnership with Antioch University. 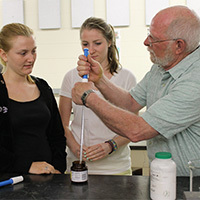 You have the opportunity to join Franklin Pierce's chapter of the National Science and Mathematics Honor Society if you meet national requirements for induction. Education extends beyond the classroom. Enroll in Tropical Forest Ecology (BI 217) and take a two-week trip in June to three field sites in Costa Rica. BEST Scholars Program The BEST Scholars Program provides unique opportunities for qualified students to thrive in an intensive learning community, supported by scholarships funded through the National Science Foundation. 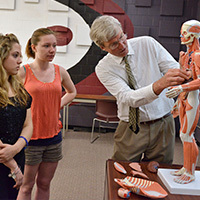 "While I was at Franklin Pierce, I was fortunate to have professors who were very supportive in my learning. My Environmental Science coursework and my social science class community organization opened a new way to impact developing countries." 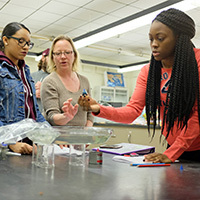 Download an Environmental Science program sheet to view on-screen or print, or view the College at Rindge Academic Catalog for specific degree requirements and course information.